Skateboarding is quite an energetic and refreshing activity that allows teens and adults to be free with their body. This sport isn’t all about fun but also enables youngsters to cover average distances quickly while enjoying a wonderful ride. But, to enjoy skateboarding, it’s essential that your skateboard is well-maintained and properly repaired. To save your time and money, you must choose the best tools from the market to repair the boards fast and better. With the help of best tool reviews, you can do it effortlessly. Skateboard maintenance is much important to enjoy smooth rides and avoid accidents. With best tools, you will be able to repair the skateboard better and faster. Here are some prominent features of skate tool you must consider while purchasing one for you. The most commonly used screwdriver in skateboard hardware is Phillips head. It is the most popular screw head in all products. 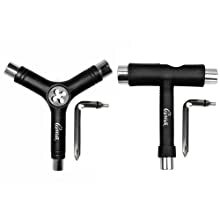 A few skateboard companies also use Allen brand’s Hex Key Head screws for their hardware work to stand uniquely in the market and give their customers an option of a more exclusive look. There are many screwdrivers in the market with different type of heads on each side, allowing skaters to repair the board using any type of screw head. When you buy a new skateboard, you need to put it together first and for that, a few standard socket sizes are required. To tighten the hardware nuts that attach the truck to the deck, you will be using 3/8” socket whereas to keep wheels on the truck’s axle, you will need 1/2” socket. When it comes to tighten or loosen the kingpins for easy turns and stable rides, 9/16” socket is best to use. When we buy skateboards with bearings already installed inside the wheels, we usually don’t consider them unless they become pretty jammed and disturb our rides. Many skaters use axle of the truck to check the bearings but this method is totally prohibited by experts as it can cause damage to the trucks. The simple and better solution is to insert a bearing remover into the wheel and slightly turn it to loosen the bearings. While attempting skateboard tricks, you fall more often and due to grinding against the pavement, axles of the trucks begin to wear down. If they are excessively damaged, you’ll have trouble in removing old wheels and installing new ones. It’s also possible that axle nut and wheel come off while you’re skating that might lead to serious injuries. To avoid such worst scenarios, you must rethread the truck axle regularly using tools with rethreading head. While applying grip tape to the deck, we use a hard flat piece of metal to trace the edges of the gripped deck for a neat and easy cutting. Many people use the edge of knife to cut it but that can be pretty dangerous due to proximity of the blade. There are a few tools in the market that include a grip tape file in their stash and come companies are also making tools solely for filling and cutting the grip tape. Size is another feature you must consider when it comes to buying and stocking up on skate tools. There are many small pocket tools in the market that you can keep with yourself whenever going for skating. There can be any lose nut or bolt that might cut your session short. 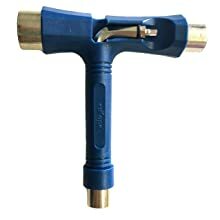 There are also big tools that perform heavy repair duties and have advance features like bearing remover and grip tape file. They are great tools to keep in your store room as you cannot carry them anywhere without a backpack. Available on Amazon, this package encompasses 1xT tool and 1xY tool with a screwdriver included in each tool. 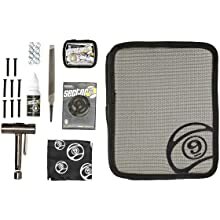 This skate tool set has everything required to tighten or loosen the nuts and assemble or repair the parts of the skateboard. It’s an impressive multifunctional, all-in-one skate tool that you can use for any kind of skateboards and longboards. It’s steel-made tool hence pretty durable but lightweight and easily portable. If you are looking for multi-functional, all-in-one skate tool at reasonable prices, this one is pretty good to get. It can be used to repair all sorts of skateboards and longboards. The best thing about this is that it comes with 3/8”, 1/2” and 9/16” sockets hence you won’t need any separate socket after getting this one. It’s a nice pocket sized tool and has a side lock feature that prevent screwdriver form falling. If you want to enjoy fast and smooth skating, use this lubricant and let your wheels roll better! It’s a 1/2 oz. 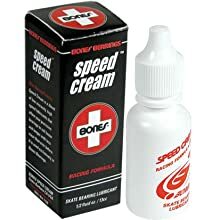 speed cream from the Bones Bearings brand and protects your skateboard’s bearings from getting jammed. No matter how old your bearings and wheels are, using this cream will prevent them from locking and freezing. It works great with all types of skate bearings and can be used once in a week to keep wheels in a fine functioning. When you need speed and perfection you have to get the ultimate bearings. Bones red bearings for skateboards come with ultimate safety, strong capture and incredible speed. They are known widely for the best performance and high-end manufacturing schemes. The tolerance of the bearings is so high that it confidently lets you try out every trick of yours. The bearing comes with the 22mm outer diameter x 7mm width and 8mm inner diameter. The stoked tool comes with the best support to screw and settle the bearings regularly. Each tool has 9/16” kingpin, 1/8” Allen, 1/2” axle and 3/8” Hardware. They are made of hardened steel with chrome finish. You can enjoy the ultimate skating regularly, even at night with full safety. In addition to time and efforts, you also require right tools to keep things in a fine flow. Losing a nut in the middle of a ride or sitting at the top of a hill to change the wheels, you come to know that you left some integral tools back at home and now you have no option than walking back with your broken skateboard in hands. Well, it’s time to change that with this complete Sector 9 Field Kit. It has all essential tools one could require during skateboard trip to hill top or regular rides. From three sized wrenches to screwdrivers and extra bearings to extra risers, it has all you could ask for as a pro skater. This single kit is all you need to deal with skateboard maintenance! 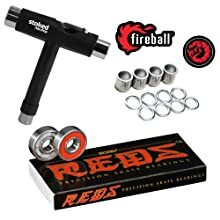 With these tools, you can enhance the performance of your skateboards and enjoy your skating sessions more than ever. Apart from these gears, there are also some more skate tools, you may check here to find something better according to your requirements. To make anything work properly, its maintenance is much essential. Same is the case with skateboards. From wheels to bearings to trucks, each and every part of the skateboards must be in good condition to keep your rides smooth. That’s only possible through regular tuning and timely repairs by using advance tools. Form pocket gears to big advance tools, stock up on all necessary skate tools to keep your board in perfect working condition.